HTC settled its patent dispute with Apple last year, but the Taiwanese smartphone and tablet manufacturer still has to overcome marketing hurdles in 2013, according to its CEO. "Our competitors were too strong and very resourceful, pouring in lots of money into marketing," HTC CEO Peter Chou told the Wall Street Journal. "We haven't done enough on the marketing front." While Chou didn't name Apple and Samsung specifically, the two companies have eaten into HTC's global market share and have a combined 106 percent of the smartphone profits. The increase in iPhone and Galaxy S3 sales has been to the detriment of HTC's Android and Windows Phone-based devices. The company's year-over-year marketshare slipped from 2.7 percent to 2.2 percent for the third quarter, according to market research firm Gartner. While Apple and Samsung are selling high-end devices in conjunction with hefty marketing, Chinese manufacturers Huawei and ZTE are having success with budget smartphones. Many analysts believe that this leaves HTC stuck in the middle. Chou, who co-founded HTC in 1997, doesn't agree. Instead, he sees a better 2013 for his company, chiefly because of innovation. "Although we don't have as much money to counter [Samsung and Apple], the most important thing is to have unique products that appeal to consumers." Chou's company is on the record as having said that its patent settlement with Apple will bring about better phones from the company. 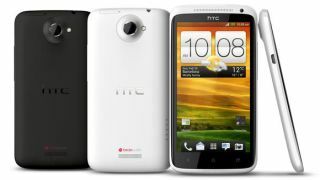 Likewise, HTC may get the boost it needs from its latest line of smartphones, including the HTC One X+, 8X and 8S. The first sign of whether or not HTC is still in trouble may come Monday, when HTC is supposed to release its preliminary fourth-quarter results.